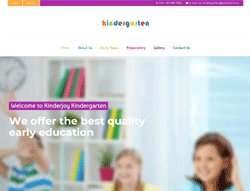 Kindergarten Joomla Template is a colorful microniche template targeting Kindergarten and Children's websites. It is designed in a clean, elegant and minimalist way to ensure a smooth experience and also focusing on content presentation with minimal distractions. The template comes packed with a wide range of features including unlimited Google fonts, clean and minimalist design, fully responsive and highly adaptive, Gzip compression to ensure that your website speed is top notch and so much more.